For a fun filled educational excursion for your class or school you can do no better than a Chessington World of Adventures Resort or THORPE PARK Resort day trip put on by The Kings Ferry. 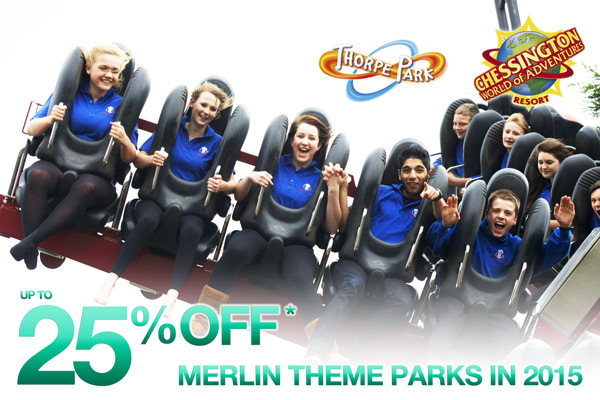 What's more.... if you book a coach trip with The Kings Ferry to these destinations before 24th December 2014 to travel at any time in 2015 we are offering up to 25% off your theme park entry fees! Chessington Word of Adventures Resort and THORPE PARK Resort both offer a number of workshops to supplement your fun filled day. When students are enjoying a lesson it shows. It shows in their attention levels, in the effort they put in and the results they achieve. The Education Programme at THORPE PARK Resort offers maximum educational value through unique and stimulating learning experiences. At Chessington World of Adventures Resort there's a world of educational adventures waiting to be explored. There's nothing like a sense of wild adventure to make your class really want to dig deeper and discover more. The Kings Ferry are a multi-award winning coach operator, most recently voted 'TOP LARGE COACH OPERATOR' at this years Route One Awards with a long history of supplying coach hire to schools and colleges. Be safe in the knowledge you are in safe hands travelling on one of our luxury executive coaches. Customers must book before 24th December 2014 for travel in 2015.